Scoliosis is a lateral (toward the side) curvature of more than 15 degrees in the normally straight vertical line of the spine. Idiopathic (unknown cause) scoliosis is the most common type of scoliosis, typically affecting adolescents from ages 10 through to 17. Idiopathic scoliosis may progress during the "growth spurt" years, but usually will not progress during adulthood. Early detection is therefore of great importance. While scoliosis may go virtually unnoticed in some children, the condition can affect a person’s ability to engage in physical activity, and in severe cases may impair the ability to walk, sit or lie down comfortably. Congenital spine deformities, genetic conditions, neuromuscular problems and limb length inequality can all be associated with scoliosis, as well as cerebral palsy, spina bifida, muscular dystrophy, spinal muscular atrophy and tumors. Scoliosis ranges in severity and can be the result of a variety of causes. People with a family history of spinal deformity are at greater risk for developing scoliosis. However, more than 80 percent of cases are the result of unknown causes. In fact, most cases are found in otherwise healthy people. The onset, in the majority of these cases, occurs in children around the beginning of puberty. There are several warning signs that help diagnose scoliosis. If a scoliosis curve gets worse, the spine will also rotate or twist, in addition to curving side to side. This causes the ribs on one side of the body to stick out farther than on the other side, which is noticeable both in the front and back of the body. Signs and symptoms typically begin during the growth spurt that occurs just prior to puberty. Although both boys and girls develop mild scoliosis at about the same rate, girls have a much higher risk of the curve worsening and requiring treatment. Family history.Scoliosis can run in families, but most children with scoliosis don't have a family history of the disease. Most children with scoliosis have mild curves and usually won't need treatment with a brace or surgery. Children who have mild scoliosis may need checkups every six months to see if there have been changes in the curvature of their spines. Girls have a much higher risk of progression than do boys. Severity of curve. Larger curves in younger adolescents are more likely to worsen with time. Location of curve. Curves located in the center (thoracic) section of the spine worsen more often than do curves in the upper (cervical) or lower (lumbar) sections of the spine. If a child's bones have stopped growing, the risk of curve progression is low. That also means that braces have the most effect in children whose bones are still growing. Our Biokineticists specialise in screening for Scoliosis and poor posture like excessive Kyphosis or lordosis. We then prescribe an effective treatment plan to reduce progression and correct spinal posture. Our exercise prescription is scientifically-based and addresses Scoliosis in all three planes – sagittal, frontal and transverse. This means that correction needs to occur not only from side to side and front to back, but must also consider the rotatory movements of the spine and the importance of the rib cage in spinal alignment. Scoliosis exercise prescription is based on Scoliosis Specific Exercise, primarily from Schroth (link) and SEAS (link) techniques. SEAS is based on a specific active self-correction technique for scoliosis performed without external aid, and incorporated in functional exercises. 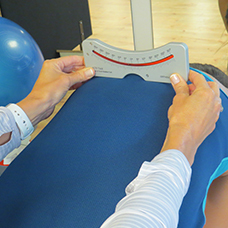 Evaluation tests guide the choice of the exercises most appropriate to the individual patient. Improvement of the stability of the spine in active self-correction is the primary objective of SEAS. SEAS trains neuromotor function to stimulate a self-corrected posture during activities of daily life. 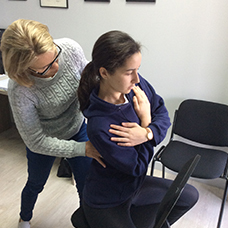 This form of exercise treatment for scoliosis has been shown to be most effective in conjunction with RSC bracing, in curves of less than 40 degrees. In addition to exercises for posture and scoliosis our focus is on lumbopelvic and scapular stability, with particular emphasis on activating the deep stabilisers of the body. This helps create awareness of correct posture and reduces further injury. Overall strength is then addressed once muscle imbalances have been established. If your child's bones are still growing and he or she has moderate scoliosis (>20 degrees Cobb angle), your doctor may recommend a brace. Wearing a brace won't cure scoliosis or reverse the curve, but it usually prevents further progression of the curve. Objectives of the RSC® Brace system. When is the use of a spinal brace required? A curvature with a Cobb angle more than 25 degrees and a Risser sign less than 4, or if surgery is not advised.